Verbascum (/vɜːrˈbæskəm/), common name mullein (sg. /ˈmʌlɪn/) (also known as velvet plant), is a genus of about 360 species of flowering plants in the figwort family Scrophulariaceae. They are native to Europe and Asia, with the highest species diversity in the Mediterranean. Mullein or "mullein leaf" often refers to the leaves of Verbascum thapsus, the great or common mullein, which is frequently used in herbal medicine. They are biennial or perennial plants, rarely annuals or subshrubs, growing to 0.5 to 3 metres (1.6 to 9.8 ft) tall. The plants first form a dense rosette of leaves at ground level, subsequently sending up a tall flowering stem. Biennial plants form the rosette the first year and the stem the following season. The leaves are spirally arranged, often densely hairy, though glabrous (hairless) in some species. The flowers have five symmetrical petals; petal colours in different species include yellow (most common), orange, red-brown, purple, blue, or white. The fruit is a capsule containing numerous minute seeds. In gardening and landscaping, the mulleins are valued for their tall narrow stature and for flowering over a long period of time, even in dry soils. Many cultivars are available, of which 'Gainsborough','Letitia', 'Pink Domino' and ‘Tropic Sun’ have gained the Royal Horticultural Society's Award of Garden Merit. Since the year 2000, a number of new hybrid cultivars have come out that have increased flower size, shorter heights, and a tendency to be longer-lived plants. A number have new colors for this genus. Many mulleins are raised from seed, including both the short-lived perennial and biennial types. The plant has a long history of use as a herbal remedy. Although this plant is a recent arrival to North America, Native Americans used the ground seeds of this plant as a paralytic fish poison due to their high levels of rotenone. 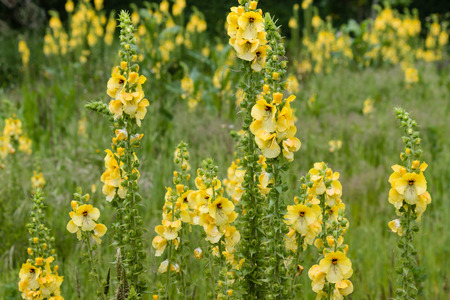 Verbascum flowers have been used in traditional Austrian medicine internally (as tea) or externally (as ointment, tea, baths or compresses) for treatment of disorders of the respiratory tract, skin, veins, gastrointestinal tract, and the locomotor system. The plant's stem, when dried, can be used in the hand drill method of friction fire lighting. "Early European settlers learned from the Native Americans how useful mullien leaves could be as toilet paper. Better than Charmin when used in the proper direction. The leaves were also good as bandages for wounds. The plant itself has strong tap roots that drill hard clay and make it more arable and suitable for growing crops. The long seed heads (cobs) provided flowers for earache medicine and the dried cobs made torches (when dipped in wax and or pine pitch) to keep insects and pests away, as well as, to light the way to the outhouse at night."